Sauteed lima beans are also pretty nom, they're chewy roasted and creamy sauteed. Both good! Wipe, trim, and slice the mushrooms. Peel and mince the garlic. Heat olive oil in a saute pan over medium high heat and saute the mushrooms until browned, about ten minutes. Add the garlic and lima beans and keep sauteeing until the lima beans are tender, about another ten minutes. Meanwhile cook the pasta until al dente, about ten minutes. Drain the pasta and when the vegetables are cooked, stir them together with about half the pasta and put away the rest of the pasta for later. 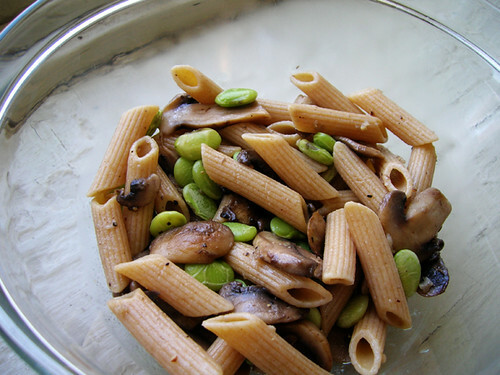 If you have cooked pasta that you put away before, you can just add it right to the pan after the mushrooms and lima beans are cooked and heat through.